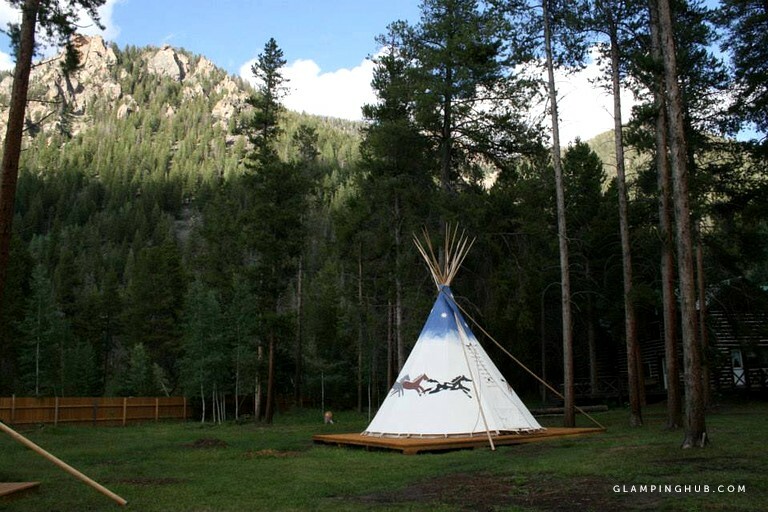 These Native American tipis, located in a breathtaking wilderness area in Colorado, provide guests with a closeness to nature they just can't get anywhere else. 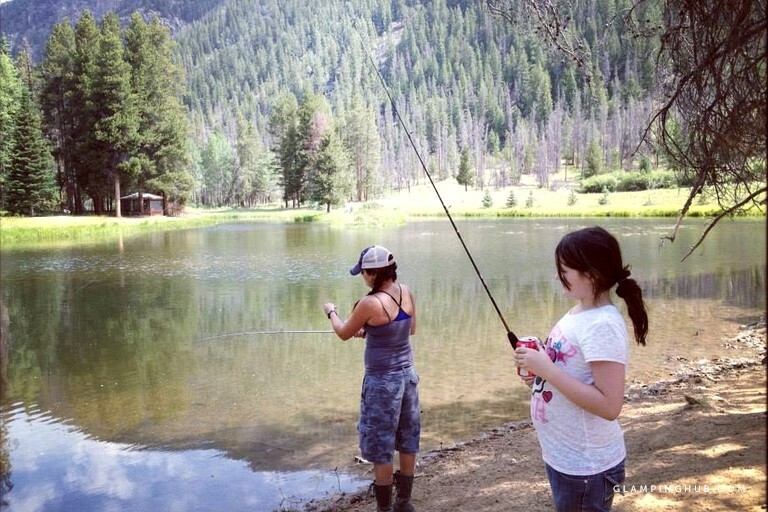 They are located at the base of the National Forest, with very close access to hiking trails, a giant lake for fishing, and tons of outdoor activities. 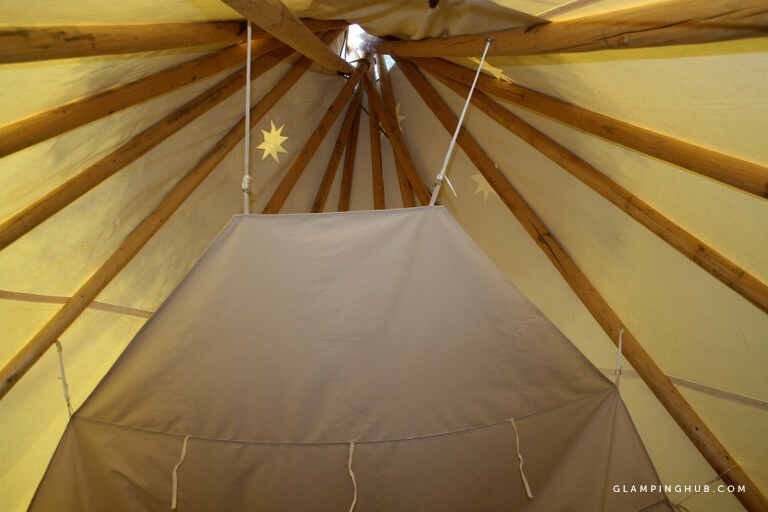 In total, there are five luxury tipis, making this space ideal for couples or small families of three. Tipi #1 through Tipi #4 have queen-size log beds, and Tipi #5 has a log bunk bed (full-size bed down below, twin-size bed up top). All beds are dressed with sheets, pillowcases, and pillows, and gorgeous Indian comforters. There are cots available per request. All of the tipis are mounted on decks, and they are lined to protect guests from the elements. 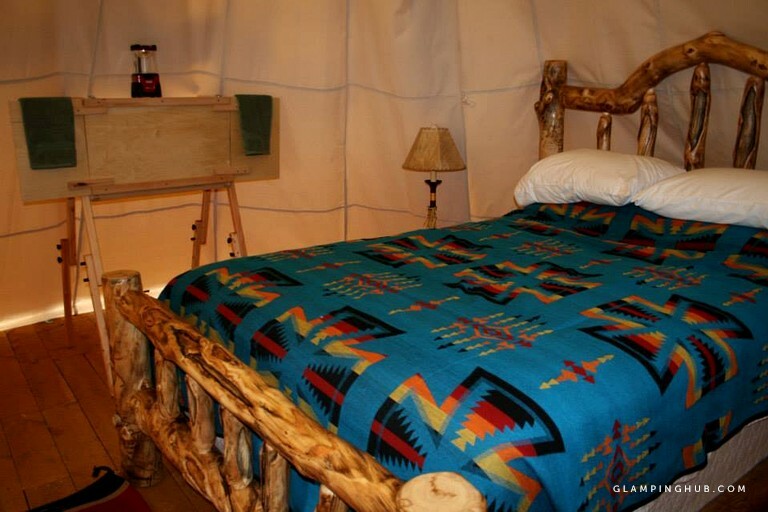 Colorful Native American rugs, cushions, and bedding adorn the inside of the tipi providing flair and comfort. Each tipi also has a camp kitchen box, equipped with pots and pans, as well as cooking and eating utensils. Ice is always readily available, and guests also get a cooler for beer or food. There is a men’s and a women’s bathroom with flushing toilets and hot showers just a short walking distance away. There are a lot of amenities to enjoy, aside from the accommodations, at this glamping property. 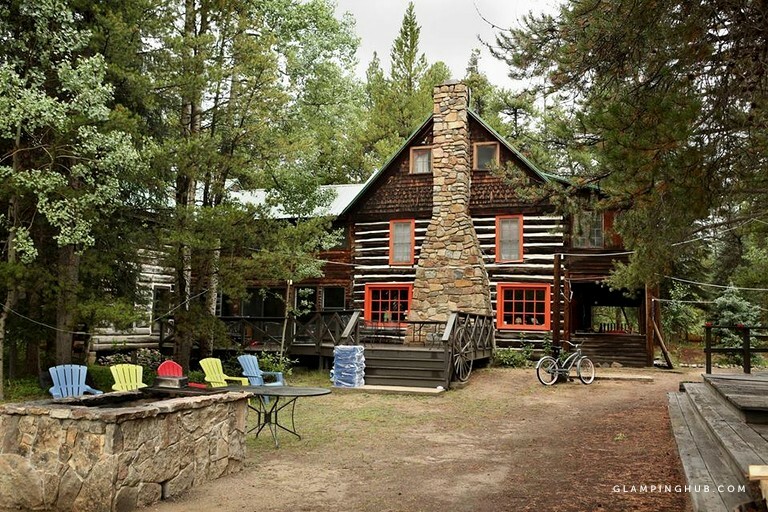 The lodge was built in the 1900s and has been renovated and updated with a cozy chic mountain lodge decor. 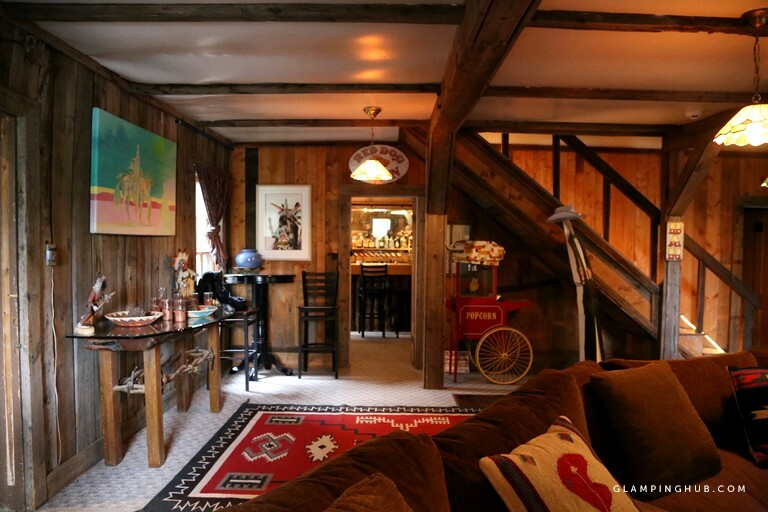 There is a large living room with a comfortable couch, chairs, and a giant fireplace, as well as a billiards room and board games. The third living area has lots of comfortable modern seating and free coffee every morning! The lodge also houses the property's country store, where many simple food items, drinks, ice, candy, and replacement fishing parts can be purchased. The host's favorite part of the lodge is The Red Dog Saloon—Colorado's Smallest Bar—where guests can have a cold beer or Bloody Mary and visit with other guests. This tiny bar packs a big punch, and guests would be surprised how much fun they can have in a 100-square-foot bar with four bar stools! Brand new for this summer is a playground for little people - located within walking distance of Tipi Village, Miners Camp, and the Lodge will be a nice sized playground where children can have a safe place to play. This picturesque glamping site is an ideal spot for weddings, reunions, and business retreats. Please inquire with the host for more information. 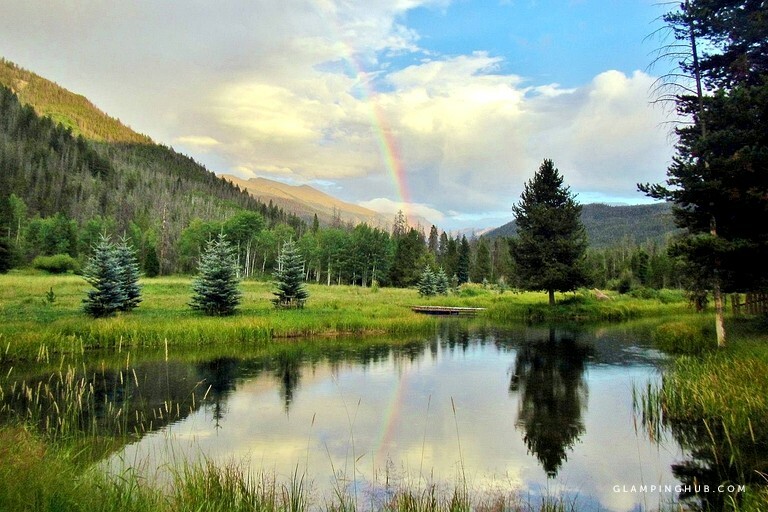 The rugged wilderness of Colorado is a playground for nature-lovers from all walks of life. This glamping site is right in the thick of it with trails leading to lakes, streams, peaks, and waterfalls. Guests can spend their days fishing in this picturesque setting in the site’s private pond, there are also several magnificent lakes in the area. 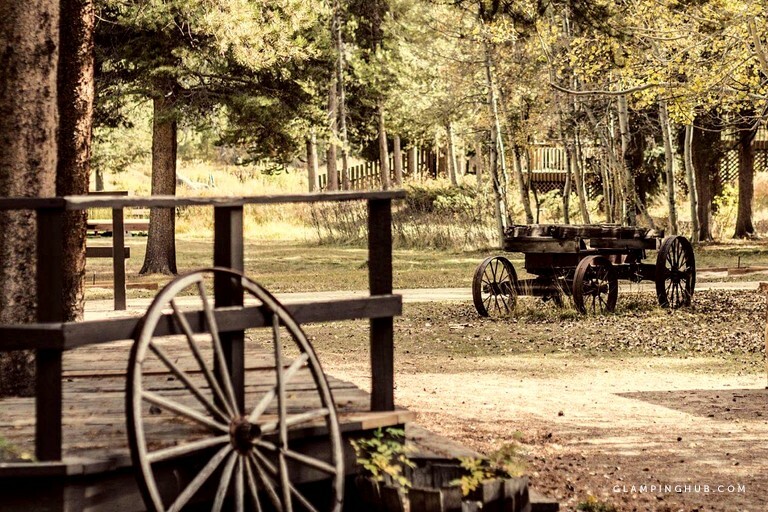 For an adventure, guests can explore Knights Ridge and Hell’s Canyon, and there are also many amateur trails nearby including a path that meanders along the Colorado River to a romantic wooden swing overlooking the valley. 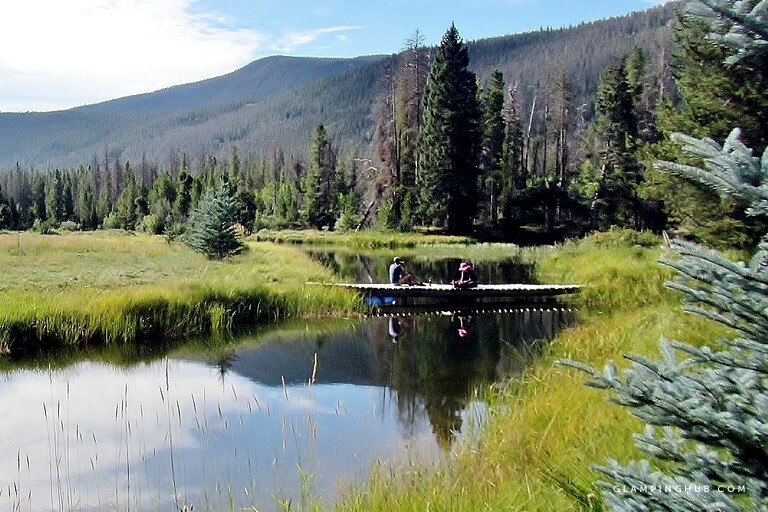 If looking for mountain scenery, it doesn't get much better than this ranch. This particular area of Colorado is absolutely breathtaking, and the land is one of its most beautiful golden nuggets. Even the dirt road that winds to the property is one of the most amazing roads guests will ever drive down. The road winds along a giant lake with picturesque views, long stretches of beautiful blue lake water, and Aspen trees for miles. 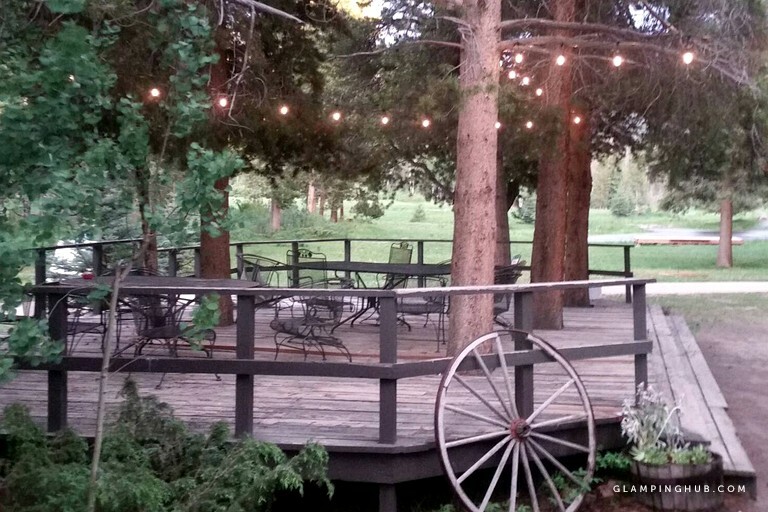 When guests drive through the gates, they will immediately see the beautiful green meadow and the private lake with the scenic Rocky Mountains as the backdrop. The ranch is home to many types of wildlife, including lots of eagles, birds, deer, marmots, moose, and even a fox every now and then! It's rare to stay a night without seeing one of these beautiful creatures. Little Indian Lake is the perfect spot for beginner fishermen, and there is a canoe guests can use for a sunset boat ride. In addition, the property runs along a beautiful river, and the private hiking trail leads to rushing rapids, secluded calm swimming holes, and even a wooden swing overlooking the river valley. The hosts call it the "kissing swing" and have had more than one marriage proposal there! Upon check-in, guests must stop at the main lodge when they arrive. They can park right in front or across the road, and it's the first building on the right once they enter the gates. They will have to fill out a check-in form and sign a waiver. 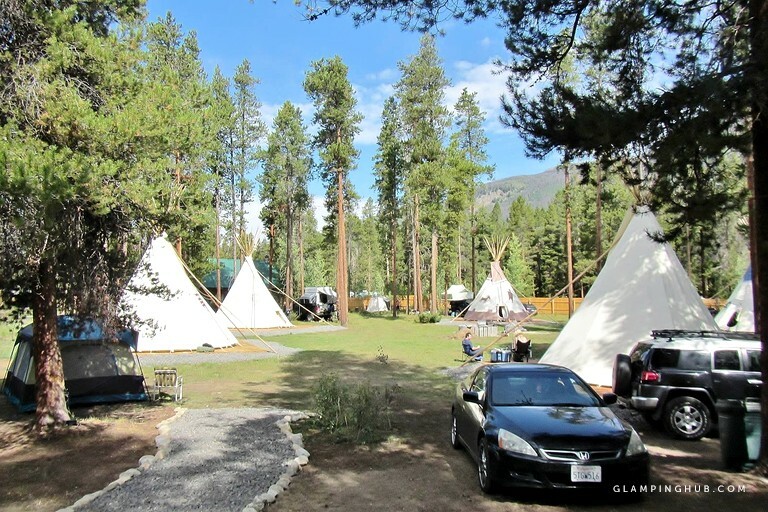 Once checked in, the hosts will show guests to their accommodation, as well as where they can park, which is usually right next to the tipi or tent. 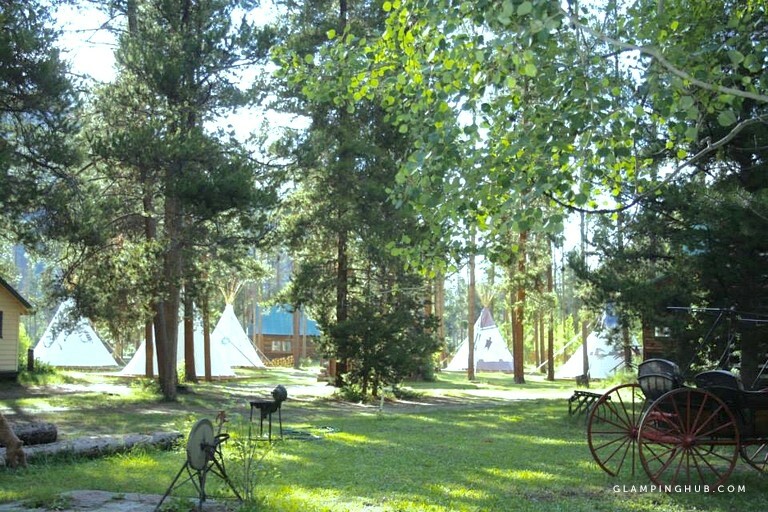 Upon check-out, guests must make sure that all items provided to them are in the tipi or tent before leaving. Guests should ensure not to forget anything behind because it is a very long drive back down the road. The hosts do not provide trash services, aside from the business in the bar; guests must pack out everything they bring in. Guests have to bring their own trash bags and plan to keep used trash bags in their card to prevent the local wildlife from getting too curious. Leftover food items and burnable paper products can be burned in the property's fire pits to help cut down on trash. The hosts advise that cans are lighter and easier to manage than glass. Guests are allowed to have personal music in their tipi or tent, as long as the music is not amplified and kept at a reasonable level. 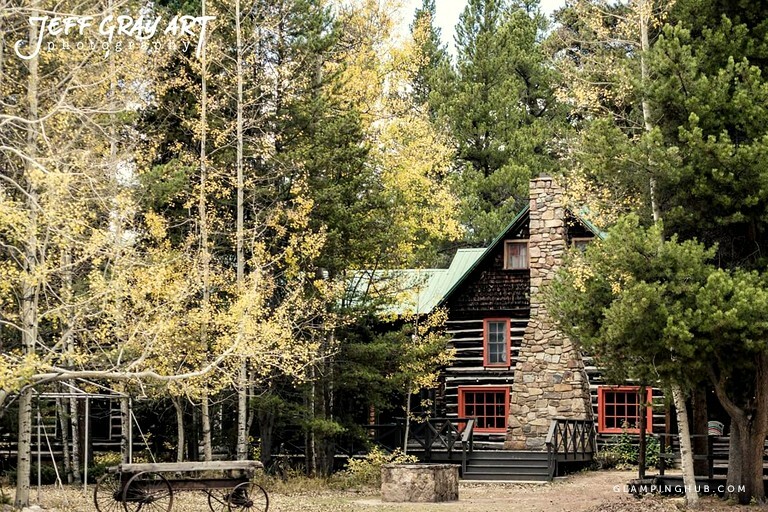 Since the property is in the forest and there are camping neighbors and cabins in the surrounding areas, guests must respect the neighbors around them. If playing music outside, it must end by 10 p.m., and the ranch reserves the right to limit volume levels accordingly. Each tipi and tent receives a bundle of wood to use in the property's fire pits. There is additional firewood for sale at the property's general store. Guests are also welcome to bring their own pre-bundled and chopped wood. The beds come fully dressed, but guests are recommended to bring extra bedding for warmth or comfort if they so desire. Two cots are provided for each tipi and tent, too, and guests should bring sleeping bags if they plan to utilize the cots. Guests can let the hosts know if they need extra bedding. 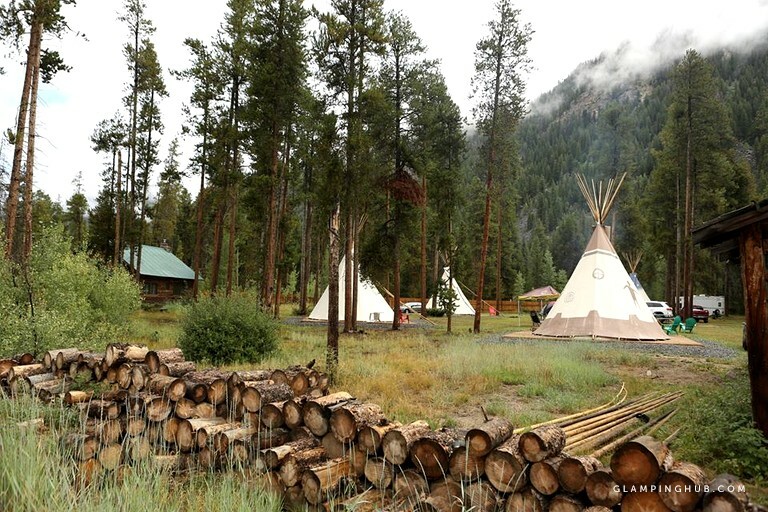 There is a brand new bathhouse in the tipi village that has flushing toilets and showers. Each tent and tipi is provided with two towels If more towels or supplies are needed, guests just need to ask the hosts. 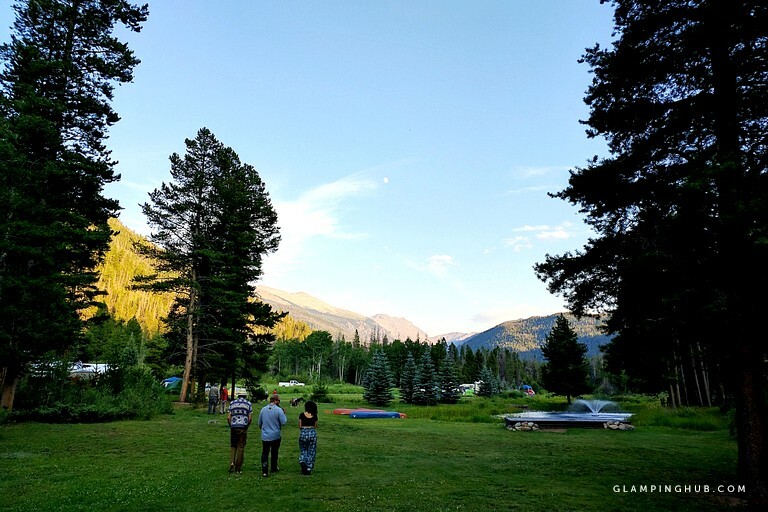 When staying at this glamping property, guests should bring the following items: food, water, and the necessary clothing. There is a small country store at the lodge for ice, snacks, sodas, and candy, but there is no restaurant, and the closest grocery store is 30 minutes away in Granby. Each tipi and tent comes with a normal-size cooler, but guests may need to bring an additional cooler depending on how much food they have. Food must be stored in tightly closed containers to risk attracting local wildlife to the tent. The property's fire pits can be used for grilling meats, vegetables, and other grillable foods. In addition, there is fresh spring water on the property and access to a spigot, which allows guests to fill up their jugs throughout their stay. In terms of clothing, the hosts recommend that guests come prepared for all types of weather. 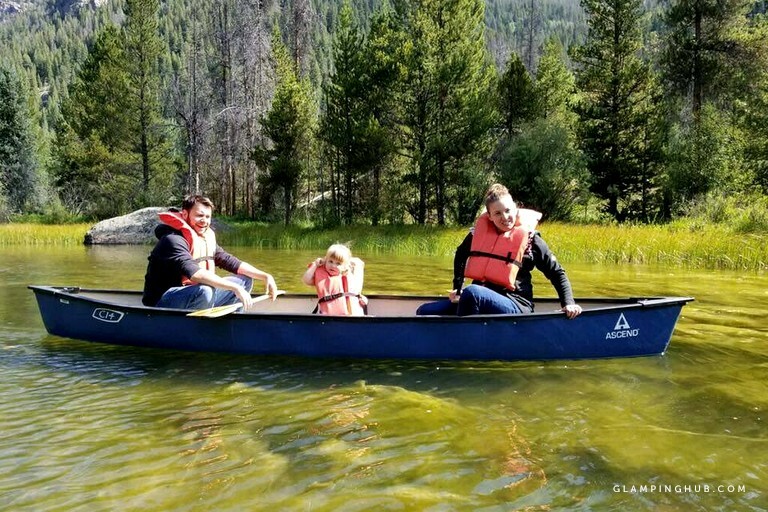 The Rocky Mountains can be unpredictable at times, and while the usual temperature is in the 80s and sunny with afternoon showers here and there, things can change quickly, and it's important to be prepared. Guests should be prepared for afternoon showers or possibly an entire day of rain (its rare, but it does happen!). Bathing suits are necessary only if guests are brave enough to take a swim in the icy cold Colorado waters. Hats and sun protection are important, as the property has an altitude of 9,000 feet, so the sun is much more powerful, and it is easier to get sunburnt. Hiking boots and/or waterproof shoes are suggested, depending on the types of activities guests want to partake in. Other items that guests should consider bringing along are sunscreen, bug spray, bicycles, paddleboards, fishing poles and bait, and games and balls. The following items are strictly prohibited: guns, fireworks, dirt bikes, ATVs, illegal drugs, and amplified speakers. 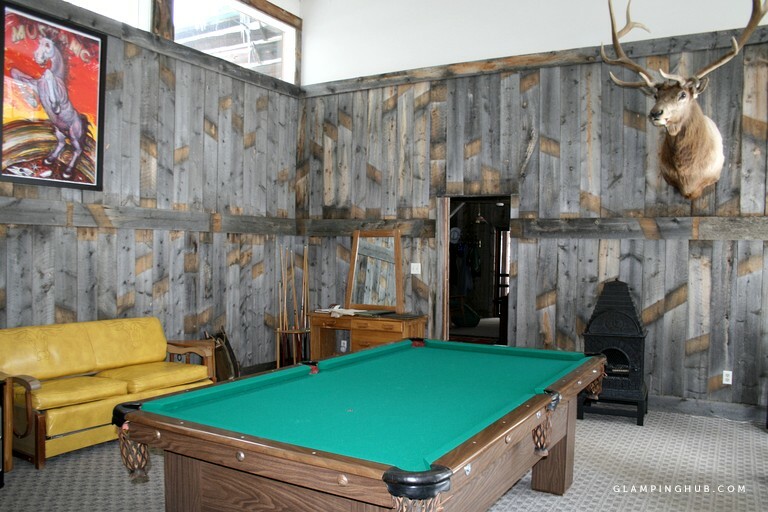 This property is BYOB, although there is an on-site saloon. The Red Dog Saloon, which is Colorado's smallest bar, is a legally operating licensed bar that serves beer and liquor. The property's liquor license extends to the entirety of the lodge while the bar is open, therefore, guests cannot bring their own alcohol anywhere in the lodge during open bar hours, which usually go from early afternoon until 2 a.m. at the latest. The property is located a good distance from local fire services, and due to the proximity to the National Forest, the property and guests are at a greater risk for a disaster like a fire. Fires are only permitted in the fire pits on-site, and the hosts will assist guests the first time they decide to set up a fire, whether at the lodge fire pit or the tipi village fire pit. They will able to get a fire going quickly and show guests how to safely start one.